Have you heard the news? Smoking is bad for you! No, like really, really bad for you. Why not quit? There! Problem solved. Er, if only it were so easy. While some smokers are no doubt proud users and would only have cigarettes pried from their cold, dead (slightly stained) fingers, a lot of folks who smoke really want to quit. In fact, the American Cancer Society cites that 2 out of 3 smokers want to quit, and about half try to quit each year. But nicotine can be as addictive as heroin and cocaine. New research based on recent Australian legislation shows that banning branded tobacco-product packaging makes quitting a bit easier. Australia introduced the new packages in 2012 to discourage new people from picking up the habit, and has seen significant declines in smoking since. It turns out that plain packaging — that is, packaging with no identifiable branding, the same standard fonts and large graphic warnings, to boot — lowers the brand loyalty of a smoker, which in turn reduces smoking intensity and strengthens intentions to quit. There have been arguments against plain packets, including criticism that plain packs are easily counterfeited and would cause an increase in smuggling. But the new research found that 178 smokers were less likely after the "unbranding" to smoke and identify with their preferred brand, and to attribute positive traits like sophistication and confidence to people who smoked that brand. The researchers even controlled for socioeconomic status, education, perceived effectiveness of the warning labels, and other factors that could have influenced the decrease in smoking behaviors. By breaking down brand identity and loyalty, the researchers surmise, the plain packaging dampens the feeling that smoking certain cigarettes will give smokers qualities they desire. And without that, it seems, people are more eager to give smoking up. 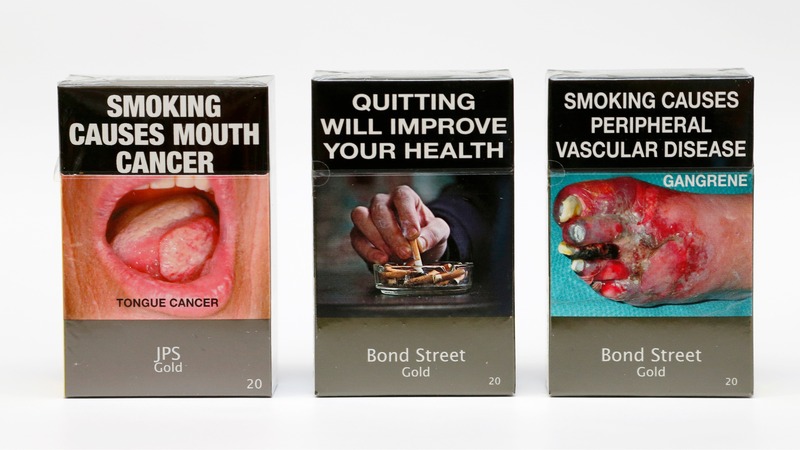 Other countries are keen to follow Australia's example and change cigarette packaging to nonbranded (and quite graphic) images. Legislation in the U.K. and Ireland banning tobacco branding passed in May 2016, and is set to be compulsory by May 2017.